A common passion in tattooing that owners Alex and Nathan share, is their love of Japanese tattooing. This extends to other artists at the studio as well who have joined the crew in order to learn and develop their craft by working alongside like­minded tattoo artists. 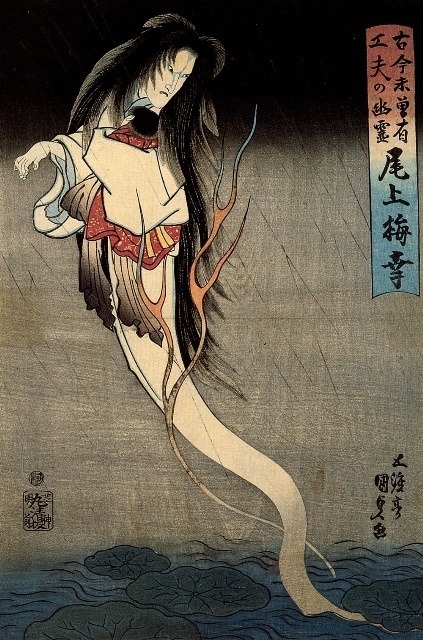 There are variations in style within the Japanese genre from artist to artist, but the main elements, based in tradition, are always present. Broadly speaking, tattooing in Japan is generally referred to as Irezumi. But more specifically, the traditional Japanese tattoo style is referred to as Wabori. Traditionally this was done by hand using needles fastened to bamboo sticks, and is referred to as Tebori which means hand ­carved or engraved. This method is still practiced today, although the outlines are almost always done by machine. Machine tattooing is referred to as Kikaibori, but the result can still be described as Wabori, implying its current status and legitimacy. Nathan can do Tebori on request, but this is subject to the appropriateness of the piece. Traditionally Japanese tattooing is characterised by a boldness and readability that leaves no ambiguity as to what is depicted in the tattoo. This is achieved through high contrast, strong line work, and a background that compliments and contrast the foreground. There is also a focus on dynamic positions and shapes that convey a sense of movement both in the portrayal of the subject as an illustration, as well as in the overall tattoo as it is positioned on the body. Most often, the use of bold colours helps the foreground to stand out from the background, which is always black and grey. In a piece that is entirely black and grey, and there is no colour in any part of the tattoo, there must still be a strong contrast created between the foreground and the background. This is done via the clever use of negative space and leaving open skin to maintain the readability of the image. In either case a decent amount of black must be present in the background to create the contrast, not only between foreground, but between the elements of the background itself. This is why it is almost always the case that an artist will complete the background first in order to establish the darkest parts of the tattoo, and from that base, maintain an adequate contrast in relation to the tones used for the subject of the tattoo. The subject of the tattoo refers to the the character or creature featured in the foreground of the tattoo. There is a huge range of subjects to choose from in the world of Japanese tattooing, but these are all most often referenced from woodblocks prints of the Ukiyo­e era in Japan. 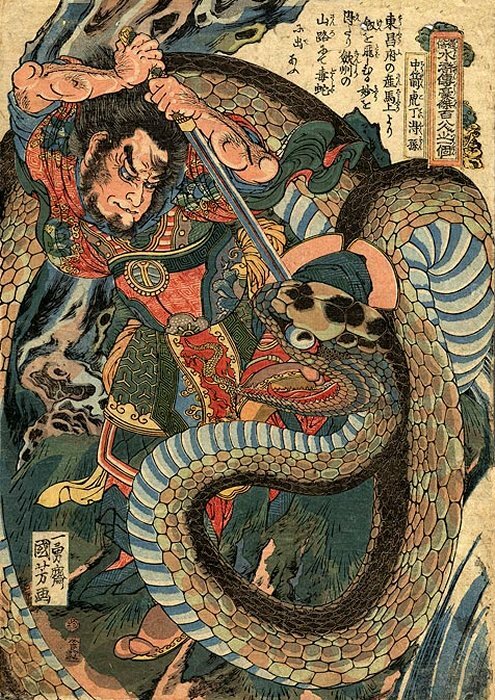 Many famous woodblock artists, such as Hokusai, Kuniyoshi, Kyosai, Kunisada, Kunichika, Yoshitoshi, Utamaro, and many more, are revered by Japanese tattooists as the originators of their imagery. There are also various famous battle scenes that have become common subjects in the tradition of Japanese tattooing. 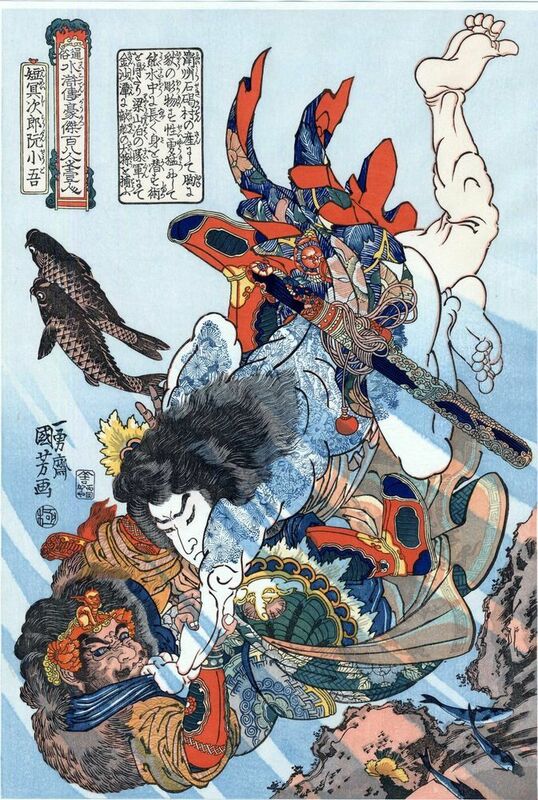 Most popular are scenes featured in Kuniyoshi’s woodblock print series “108 Heroes of the Suikoden” and various woodblock artists’ depictions of scenes form Japan’s Genpai War. For the background of the tattoo, one must consider the environment and season appropriate to the subject. The traditional background elements are wind bars, clouds (often referred to as bubble cloud), wind spirals, water, finger waves, and rocks. These should all be done solely in tones of black and grey as this separates the foreground and background most effectively. Many subjects have traditional flower pairings (for example, a peony traditionally accompanies a shi shi). And many subjects and flowers are associated with a specific season or environment. This can make for ‘correct’ and ‘incorrect’ ways of putting the subject, accompaniment, and background together. And where the ultimate goal is to join tattooed sections of the body together into a whole, or bodysuit, it is important to keep these features consistent. For the client, all these elements can be chosen because of the story they tell and symbolism they carry, or simply because they appeal to the wearer on an aesthetic level. Many of the elements have specific meanings or stories, but many are more loosely symbolic, and some are simply visually appealing. At Lighthouse, our Japanese tattoo specialists love doing the classics, but we invite clients to explore the huge range of subjects available to them within the traditional Japanese tattoo genre.